Collaboration is a strategic imperative for UBM – you can’t have a high performing culture or a high performing business without it. But knowing collaboration is important and doing it are two different things; after all, collaboration is hard and collaboration is scary. Working out loud is a key behaviour of social collaboration, but it takes courage. Collaboration happens in the open, and it takes guts to share what you’re working before you’ve finished; it means working through your mistakes openly, sticking your head above the parapet, and sometimes it can feel like bearing your soul in pursuit of an idea. So while we’ve already taken the step towards making collaboration easier with the Hub – the tool which enables us to share, discover and debate our thoughts, ideas, templates, knowledge, strategies and processes with our global colleagues – it doesn’t make it less scary. But bravery does pay off. By getting other people’s eyes – and more importantly their brains – on your work it helps you get things done and makes the outcome of your project/campaign/pitch/strategy much better than if you’d developed it in isolation or the perceived safety of your silo. Your colleagues want you to do well and, more importantly, they want to help you get there. Collaboration doesn’t have to be scary. 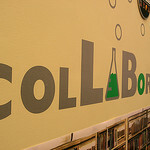 This entry was tagged Collaboration, Collaborative Software, ESN, Social Business. Bookmark the permalink. ← Is LinkedIn about to kill Groups?